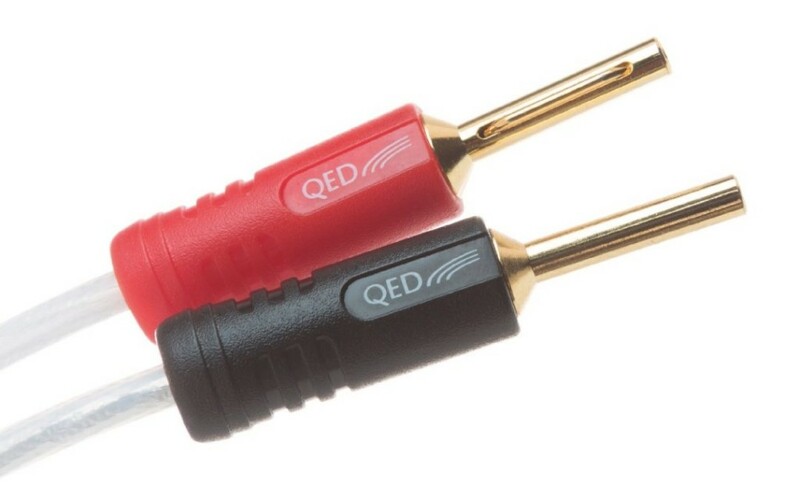 Why do QED speaker cables make a difference? Loudspeaker cables must deliver electrical power to the speakers and that means that they must have a large current carrying capacity. As current flows through the cable it encounters electrical resistance and therefore voltage is dropped across the cable and musical fidelity is lost. Unfortunately the losses are not linear (see graph) because the loudspeaker is a complex load of varying impedance (yellow line), so at different frequencies the speaker cable represents a different proportion of the total load seen by the amplifier. This means that a high resistance speaker cable (green) has the potential to adversely affect the frequency response of the loudspeaker and this effect is greater the higher its resistance. 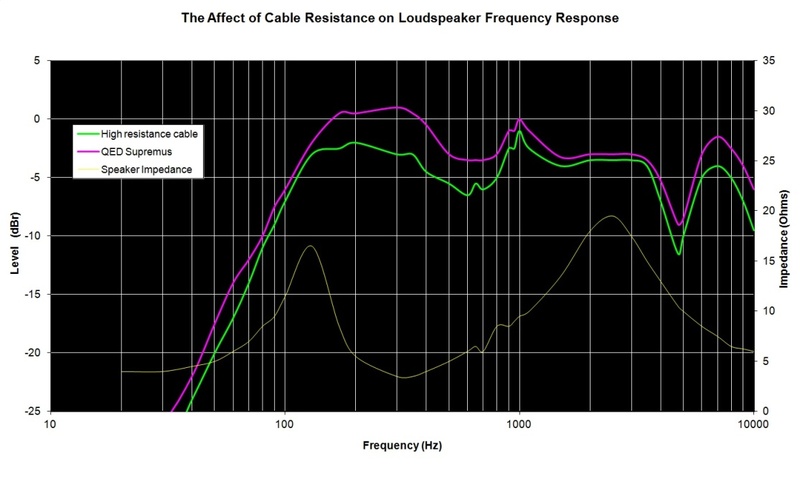 It is therefore important to ensure that the speaker cable has the lowest possible resistance and the smallest effect on the loudspeaker response (magenta line). The easiest way to achieve this is to increase the cross-sectional area to the largest practical size that is acceptable to the user. The trouble is, in traditional large cross-section cables, whether solid core or multi-stranded, high pitched sounds are forced to travel towards the outside of the conductor and so are able to use less and less of the available cross-sectional area as the pitch increases. This is called the “Skin Effect”. 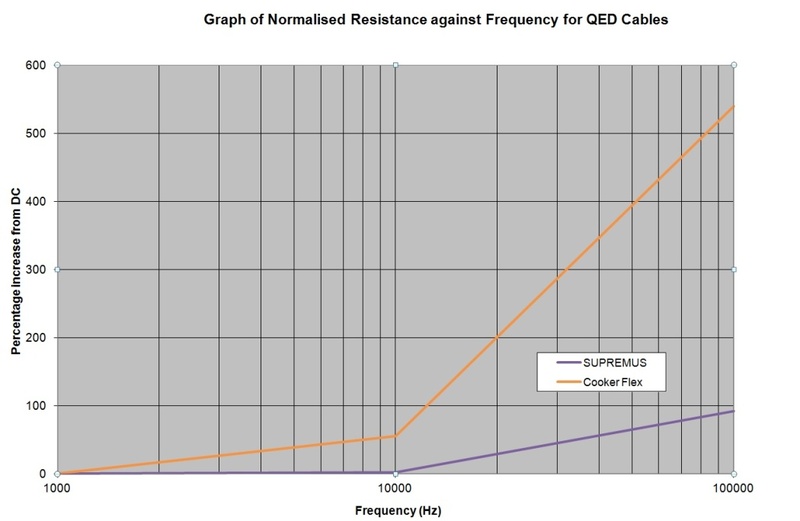 It means that for high frequencies the resistance of the cable appears to be much higher than it does for lower pitched sounds (see the orange line in the graph below). This has a detrimental effect on the fidelity of the sound you hear. QED X-Tube™ Technology solves this problem by creating a hollow, tubular, conductor geometry through which each frequency can pass with equal ease when compared to traditional solid or stranded conductors. QED AirCore™ Technology goes even further and features a special Litz-like cable geometry designed to obviate an equally damaging sonic problem known as the “proximity effect”. Where two conductors are laid side by side and carry current in opposite directions, the alternating magnetic fields built up around each conductor tend to reinforce current flow in the parts of the conductors which are nearest to each other and to cancel current carried in the side of the conductors furthest away. Therefore in a normal “figure of eight” cable the proximity effect will still cause the resistance to rise by up to 25% within the audio band – affecting linearity and therefore fidelity of the music being conveyed. QED cables which feature AirCore™ Technology avoid this problem entirely. Each of the 99.999% oxygen free solid copper cores which comprise the conductors within the cable are individually insulated and twisted around a hollow central polyethylene core so that no single conductor remains at the outside or inside of the overall conductor along its entire length – thus evening out the current density and keeping the resistance uniform throughout the audio band (purple trace). Speaker cables carry alternating current and therefore have a magnetic field constantly growing and collapsing around their conductors. This causes an electromotive force to be generated within the cable which opposes the flow of current. This effect is known as self inductance and will be greater the further apart the current carrying conductors are spaced in the speaker cable. Adding large amounts of inductance in series with the speaker can produce an audible high frequency loss and phase shift which both affects the fidelity of the sound you hear and the accuracy of the stereo soundstage; it is therefore vital to keep cable inductance as low as possible. In addition the two current carrying conductors in a speaker cable act like the plates of a capacitor and the insulating material between them forms the dielectric. If the spacing of the conductors is very small then the capacitance will be high and if the conductors are spaced further apart then the capacitance will be lower. Given the same conductor spacing, a dielectric material with a high relative permittivity will create a higher capacitance than a low permittivity dielectric. Another issue is the dissipation factor of the dielectric material. Dissipation factor is an indicator of how much energy will be lost while charging and discharging the cable during each alternating cycle. Materials with low permittivity also tend to have low dissipation factor. Large amounts of capacitance across an amplifier output can cause instability, especially at high frequencies, with many listeners describing high capacitance cables as harsh. It is therefore important to keep capacitance and dissipation factor of the cable as low as possible. Unfortunately ordinary large cross-section cables will have high capacitance due to their poor quality dielectric and high inductance caused by the necessarily increased spacing of their large conductors. Many of our competitors have tried to solve these problems but there is a catch 22 problem here. In order to make the capacitance lower they move the conductors further apart which only increases the inductance and in order to make the inductance lower they move the conductors closer together again which only increases the capacitance. At QED we have applied our research techniques to escape this trap. By using low permittivity dielectric materials such as Low Density Foamed Polyethylene instead of the more usual PVC we get an immediate improvement in capacitance measurement for the same geometry and because of a useful side benefit of both X-Tube™ and AirCore™ Technology the conductor spacing can be increased to gain a further improvement. The electric fields that generate self inductance act towards the centre of each conductor, so by removing the conductor from the centre we reduce the self inductance of any cable given the QED treatment by up to half of that which would normally be expected. This means that we can increase conductor spacing to reduce capacitance without increasing inductance; this is only possible through the use of X-Tube or Aircore™ technology, an option that is simply not available to our competitors. Owners of high end hi-fi systems know that each sonic upgrade requires a greater and greater investment in audio hardware. It is imperative that these hard won tiny improvements are not swamped by inadequacies in the link between amplifier and speakers. They make sure that the fidelity of their system is maintained throughout and very many use QED cables for this reason.